This PDF 1.4 document has been generated by XSL Formatter V4.1 MR5 (4,1,2007,0509) for Linux / Antenna House PDF Output Library 2.4.0 (Linux), and has been sent on pdf-archive.com on 30/09/2016 at 22:30, from IP address 37.239.x.x. The current document download page has been viewed 379 times. File size: 1.8 MB (26 pages). Chem Res Toxicol. Author manuscript; available in PMC 2010 October 1. Chem Res Toxicol. 2009 October ; 22(10): 1669–1679. doi:10.1021/tx900096j. 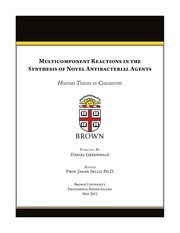 Okolotowicz†, John R. Cashman†, Shubham Vyas‡, Jeremy M. Beck‡, Christopher M.
in the development of biological therapeutics against nerve agent toxicity are also discussed. used by scientists as model compounds to evaluate cholinesterase-OP compound interactions. different steric interference encountered by the different enantiomers. to hydrolyze the Rp isomers GF and GD more efficiently than their respective Sp isomers. enzyme variants for nerve agent inhibition stereoselectivity. incubation with 2.5 M NaOH and 10% ethanol before disposal. Methylphosphonothioic dichloride was obtained from Digital Specialty Chemicals, Ltd.
acetylthiocholine iodide (ATCh), butyrylthiocholine iodide (BTCh), and 5,5’-dithiobis(2nitrobenzoic acid) (DTNB) were purchased from Sigma-Aldrich Chemical Co. (St Louis, MO). provided by Dr. Lockridge (University of Nebraska Medical Center, Omaha, NE). treatment with phosphomolybdic acid or cerium molybdate solutions followed by heating. for 31P-NMR analysis of 5-7. 9H); 31P-NMR (200 MHz, CDCl3) δ: 53.3; Rf (9:1 CH2Cl2: CH3OH) = 0.32. MHz, CD3OD) δ: 54.9. Single peak was observed for 31P-NMR analysis of 8-10. 1H), 2.95 (s, 3H), 2.91 (s, 3H), 2.60 (d, J = 11.8 Hz, 3H), 0.75 (d, J = 6.6 Hz, 3H). (quart, J = 7.5 Hz, 2H), 2.82 (s, 3H), 2.79 (s, 3H), 1.32 (t, J = 7.5 Hz, 3H). 9%) or 11-Rp (67 mg, 9%) was collected by decanting the liquid and drying under high vacuum. molar extinction coefficient of 13,600 M−1cm−1 (23). in 50 mM potassium phosphate buffer (pH 7.2) at 25°C in the presence of 0.2 mM DTNB. calculated from the molar extinction coefficient of 13,600 M−1cm−1 (23). rate constants ki were determined by linear regression analyses of the slope. with a total of 200 standard genetic algorithm docking simulations for each of the analogues. (Version 3.00, Graphpad, Inc., La Jolla, CA). Best fit values and standard errors are presented. chromatography, PTLC or filtration. Optical purity was analyzed for selected OP compounds. Sp and Rp 5-10, respectively. any detectable level of hydrolysis. semi-logarithmic plots of ln(residual AChE activity) versus time of incubation (Figure 1). This file has been shared by a user of PDF Archive. Document ID: 00489712.